The advancement of bioinformatics in the past decade has enabled plant researchers to obtain extensive knowledge of the genotype information of a number of plants. However, the progress in plant phenotype analysis (especially 3D phenotype) is still quite limited. 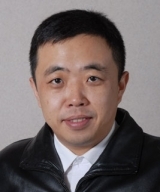 Duan is interested in using advanced imaging technology and image analysis tools to bridge this gap and to construct the corresponding correlations between genotypes and phenotypes. His lab is working to employ novel deformable models to reconstruct the 3D shapes of the leaves, kernels, and roots of plants from multi-view 2D images. The reconstructed 3D shape of the plant will enable his lab to calculate various geometric invariants such as Mean/Gaussian curvature and first/second fundamental forms. These invariants are essential for conducting comprehensive structural and statistical shape analyses (e.g., spherical harmonic analysis and conformal mapping) to extract the 3D phenotype and to investigate and quantify the correlations between phenotypes and their corresponding genotypes. Best Paper Award, GRC conference, Stony Brook, 2003. Lecturer, "Deformable Models & Applications", International Workshop on Image Processing, Computer Vision/Graphics, Hangzhou, China, December 2004. Xi Y, Li X, Duan Y and Maerz N. Virtual navigation of interior structures by lidar. Proceedings of SPIE - The International Society for Optical Engineering 2011;8037(art. no. 80371E). Karpman D, Ashbrook D, Li X, Duan Y and Zeng W. Lidar depth image compression using clustering, re-indexing, and JPEG2000. Proceedings of SPIE - The International Society for Optical Engineering 2011;8037(art. no. 80370G). Shi F, Huang X and Duan Y. A hybrid approach for robust corner matching. Lecture Notes in Electrical Engineering 2011, 88 LNEE:169-177. He Q, Karsch K and Duan Y. Semi-automatic 3D segmentation of brain structures from MRI. International Journal of Data Mining and Bioinformatics 2011;5(2):158-173. Shi F, Xi Y, Li X and Duan Y. An Automation System of Rooftop Detection and 3D Building Modeling from Aerial Images. Journal of Intelligent and Robotic Systems: Theory and Applications 2010;1-14. He Q, Duan Y, Karsch K and Miles J. Detecting corpus callosum abnormalities in autism based on anatomical landmarks. Psychiatry Research - Neuroimaging 2010;183(2):126-132. Duan Y, Xi Y. An iterative surface evolution algorithm for multiview stereo. Eurasip Journal on Image and Video Processing 2010;(art. no. 274269). He Q, Christ SE, Karsch K, Peck D, Duan Y. Shape analysis of corpus callosum in phenylketonuria using a new 3D correspondence algorithm. Progress in Biomedical Optics and Imaging - Proceedings of SPIE 2010;7626:(art. no. 76260A). He Q, Karpman D, Duan Y. Statistical 3D shape analysis of gender differences in lateral ventricles. Progress in Biomedical Optics and Imaging - Proceedings of SPIE 2010;7626(art. no. 762609). Duan Y, He Q, Yin X, Gu X, Karsch K, Miles J. Detecting corpus callosum abnormalities in autism subtype using planar conformal mapping. International Journal for Numerical Methods in Biomedical Engineering 2010;26(2):164-175. Shi F, Huang X, Duan Y and Chen S. Part-based model for visual detection and localization of gas tungsten arc weld pool. International Journal of Advanced Manufacturing Technology 2009;1-8. Yang F, Lu Y and Duan Y. Combining hierarchical segmentation and shape context based recognition. Proceedings - 2008 IEEE 8th International Conference on Computer and Information Technology, CIT 2008 2008;art no., 4594783):839-844. Yang F, Duan Y and Lu Y. Semi-supervised edge learning for building detection in aerial images. Lecture Notes in Computer Science (including subseries Lecture Notes in Artificial Intelligence and Lecture Notes in Bioinformatics) 2008;5359 LNCS(Part 2):95-104. Xi Y and Duan Y. A novel region-growing based iso-surface extraction algorithm. Computers and Graphics (Pergamon) 2008;32(6):647-654. Karsch K, Grinstead B, He Q and Duan Y. Web based brain volume calculation for magnetic resonance images. Proceedings of the 30th Annual International Conference of the IEEE Engineering in Medicine and Biology Society, EMBS'08 - "Personalized Healthcare through Technology" 2008;art. no. 4649380):1210-1213. Ikeda O and Duan Y. Optimal spectral and spatial weights for photometric stereo for accurate shape reconstruction. Proceedings - International Conference on Image Processing, ICIP 2008;art. no. 4712161):1940-1943. He Q, Karsch K and Duan Y. A novel algorithm for automatic brain structure segmentation from MRI. Lecture Notes in Computer Science (including subseries Lecture Notes in Artificial Intelligence and Lecture Notes in Bioinformatics) 2008;5358 LNCS(Part 1):552-561. He Q, Karsch K and Duan Y. Abnormalities in MRI traits of corpus callosum in autism subtype. Conference proceedings : ... Annual International Conference of the IEEE Engineering in Medicine and Biology Society. IEEE Engineering in Medicine and Biology Society. Conference 2008;2008(3900-3903. He Q, Duan Y, Yin X, Gu X, Karsch K and Miles J. Detecting thalamic abnormalities in autism using cylinder conformal mapping. Lecture Notes in Computer Science (including subseries Lecture Notes in Artificial Intelligence and Lecture Notes in Bioinformatics) 2008;5359 LNCS(Part 2):743-751. Xi Y and Duan Y. A region-growing based iso-surface extraction algorithm. Proceedings of 2007 10th IEEE International Conference on Computer Aided Design and Computer Graphics, CAD/Graphics 2007 2007;art. no. 4407867):120-125. He Q, Duan Y, Miles J and Takahashi N. Statistical shape analysis of the corpus callosum in subtypes of autism. Proceedings of the 7th IEEE International Conference on Bioinformatics and Bioengineering, BIBE 2007;art. no. 4375694):1087-1091. Duan Y, Heckenberg G, Xi Y and Hao D. Thalamus segmentation from diffusion tensor magnetic resonance imaging. Annual International Conference of the IEEE Engineering in Medicine and Biology - Proceedings 2006;art. no. 4030176):3628-3631. Xi Y, Heckenberg G, Duan Y and Zhao H. A new modeling algorithm for implicit surface polygonization. Proceedings of SPIE - The International Society for Optical Engineering 2005;5675(art. no. 09):72-79. Pai D, Jiang J, Hua J, Duan Y, Muzik O and Lu S. Segmentation of brain structures using PDE-driven surface growing. Annual Conference of the North American Fuzzy Information Processing Society - NAFIPS 2005;2005(art. no. 1548573):424-428. Hua J, Duan Y and Qin H. Design and manipulation of polygonal models in a haptic, stereoscopic virtual environment. Proceedings - International Conference on Shape Modeling and Applications, SMI'05 2005;2005(art. no. 1563220):146-155. Heckenburg G, Xi Y, Duan Y, Hua J and Muzik O. Thalamus segmentation from MRI images by Lagrangian surface flow. Annual International Conference of the IEEE Engineering in Medicine and Biology - Proceedings 2005;7 VOLS(1617115):3039-3042. Duan Y, Hua J and Qin H. Interactive shape modeling using Lagrangian surface flow. Visual Computer 2005;21(5):279-288. Duan Y, Yang L, Qin H and Samaras D. Shape reconstruction from 3d and 2d data using pde-based deformable surfaces. Lecture Notes in Computer Science (including subseries Lecture Notes in Artificial Intelligence and Lecture Notes in Bioinformatics) 2004;3023(238-251. Duan Y and Qin H. A subdivision-based deformable model for surface reconstruction of unknown topology. Graphical Models 2004;66(4):181-202. Duan Y, Hua J and Qin H. HapticFlow: PDE-based mesh editing with haptics. Computer Animation and Virtual Worlds 2004;15(3-4):193-200. Duan Y and Qin H. Intelligent Balloon: A subdivision-based deformable model for surface reconstruction of arbitrary topology. Proceedings of the Symposium on Solid Modeling and Applications 2001;47-58. Duan Y and Qin H. A novel modeling algorithm for shape recovery of unknown topology. Proceedings of the IEEE International Conference on Computer Vision 2001;1402-409.